There has been growing public anxiety over acts of violence in schools. The main question being asked is “What security measures are being taken to ensure that children are safe while in school?” Shooting incidents in schools have caused an uproar and has led to insecurity among teachers, parents and students as well. The government and communities must work together to ensure that security and safety measures are being heightened in schools. A school’s management team has the biggest role to play to ensure that student learn in an environment that is safe and secure. In this article, we will discuss about security measures that schools should take to increase student safety and reduce school violence. Both private and public schools have increased their security systems in different ways. Schools are advised to lock all unmonitored entrances and limit access to their property. There should be more security guards in each school who are required to check all visitors coming in through a physical search. Schools with less security guards should hire security guard services in Montreal to make sure that there is enough guards to patrol the areas around the school. Metal detectors should be installed in entrances at every school. At first this may be uncomfortable especially for students, but it is better to be safe than sorry. The walk-through metal detectors should be manned by professional guards who are trained in the field. Also, school administrations should conduct random weapons screenings. For a long time, only private schools have their students wear uniforms. More and more public schools are now requiring their students to wear uniforms too. This is an important practice because it makes it easy to differentiate between students and intruders. As part of the school uniform, some schools require their students to carry only see-through bookbags, backpacks and purses. This allows officials to see what students are carrying to school and they can easily be able to detect illegal substances and weapons. The presence of security personnel and law enforcement officials is rapidly increasing in schools. These officials do more than just provide security in schools. They conduct searches, assist with investigations of students who commit crimes and break school rules and patrol school grounds. Security personnel are in a better position to easily identify suspicious activity within school grounds and being at the right place at the right time can help these officials to counteract criminals with ill intentions. There have been cases of where some students have turned on their fellow students to cause harm. This has led schools to provide violence prevention programs to help prevent violence before it happens. These programs are meant for students who have been reported to have acts of violence and they help these students to show them that their acts are unacceptable in order to prevent them from committing future acts of violence. Also, these programs avoid criminalizing violent students and instead nurture them to be responsible and peaceful young adults. What are some of the advantages of taking such security measures in schools? Most companies looking for security services debate within themselves whether to have an in-house security team or contract external security staff. When a company is looking for security elements like loyalty, training, supervision and control, they have an option to either consider outsourced or in-house security officers. There are several benefits of outsourcing security companies in Montreal for all your safety and security needs. Before a security company can start working for a company, a contract has to be signed first. When the contract is signed, there is a trust and commitment which forms between the two companies over time. Both parties have to sign a contract which serves as a legal document and it states how each part will do their part. Security companies are upheld by contracts they sign and they understand that they are under the oath of these contracts. They are required to provide security and safety services that meet or/and exceed the expectations of the contract. The main advantage of outsourcing security services is that a company can easily request a security company for a new officer and get one without delay. With in-house security, if company owners do not like the performance of certain security personnel, they have to relieve them of their duties. They then have to undergo through the daunting task of looking for a replacement to fill the vacancy. 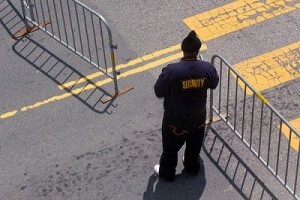 Private security companies always have security officers on standby specifically for such reasons. Putting together an in-house security personnel require time and resources. A company has to advertise for security positions within the company which costs money. Also, a company needs to acquire an insurance policy which prolongs the process. Before picking the right candidates, the company has to vet all these applicants and sometimes the information provided may not be accurate. It is easier to outsource security services from a private security company. All you have to do is pick your phone, make a few inquiries about the services offered by the security company and get the security personnel that you need within no time. Once a contract is signed, a company can rest assured that professionals are now handling the rest. Having an in-house security personnel means that a company is liable for them and their actions. In extreme circumstances, this can be detrimental. As mentioned before, a company has to have an insurance policy to cover the in-house security program and this is expensive to maintain. Hiring private security firms means that a company does not have to take any liability on the security company. Security companies are required by law to be heavily insured. In case an incident happens where a security guard is held responsible and a lawsuit ensues, the security company is responsible to take care of all expenses incurred and any payments that may need to be made. The first thing a company should check for in a security company is experience. You can find out if the company is reliable by checking their track record and reviews from other clients who have worked with them. As mentioned earlier, every private security firm is required to have an insurance policy. You should ensure that the company is insured to rest assured that they are able to incur any costs caused by their actions during their tenure. Some companies and educational institutions have installed metal detectors at their entrances, screening incoming human traffic for contraband and weapons as they arrive. Investing in metal detectors at places of work and in school is important to ensure everyone’s safety. These metal detectors need security personnel to man the entrance in order for them to be effective. Before installing a metal detector in your establishment, it is important that you talk to one of the security companies in Montreal to help you pick the right equipment that will suit your needs. You also need to hire professional security guards who are experienced in operating metal detectors. Why should you hire professionals when you want to use metal detectors which are programmed to detect contrabands and weapons? Not just anyone can operate metal detectors. Security guards undergo through special training to help them operate metal detectors with simplicity and ease. A metal detector is just programmed to detect weapons and contrabands, but they need to be manually supervised. Metal detectors, just like any other machines, do break down from time to time. In an incident where a metal detector suddenly stops working, security guards take over by doing physical inspections of everyone going through an entrance. Guards are trained to pat down everyone coming in and check their bags for any suspicious items. Trained security guards have been trained to carefully examine everyone going through an entrance for suspicious behavior. Research shows that people with bad intentions have a certain body language that only experienced security personnel can detect. It is possible for an individual to successfully pass through a metal detector, but if their body language is wanting, security guards ask them to step aside for further and thorough inspection. For example, at airports, a passenger can be asked to step aside by a security guard if they are convinced that something is not right. The passenger will be taken into a private room where they may be asked to strip their clothes or questioned further about their presence in the airport. The presence of metal detectors can be intimidating to some people. Keeping everyone safe and secure is a serious job. However, guards have been trained to be receptive and friendly towards visitors coming through the metal detectors in order to make them comfortable. Hiring unprofessional security guards to operate metal detectors can send the wrong vibes to people coming in and it can affect business negatively. A professional security guard is trained on how to handle different conversations and to be calm. In cases where metal detectors do pick on dangerous weapons, trained guards are well prepared to handle the situation if it gets out of hand. These guards are equipped with guns and other weapons to ensure that they are able to apprehend suspects and bring them into custody. Before the law enforcement officers arrive, security guards are in charge of assessing whether the suspect is dangerous or not. They have been trained on how to handle different dangerous situations therefore save a situation before it gets worse. What should you look for in a security company? Experience: A good security firm should have ample experience in order to guarantee total security and safety. Before private security firms can operate, they are vetted by government security agencies to ensure that they are well equipped to train their guards. Licensed: Security companies need to be licensed before they can operate. Find out if the firm is genuine and if it has been registered and licensed to operate. Insured: All private security firms are required to be heavily insured. The firms have liability to anything that happens under their tenure in case of a lawsuit.